WalkInJerusalem: We Refuse to be Enemies! Enemy? Me? Not going to be one. No way! 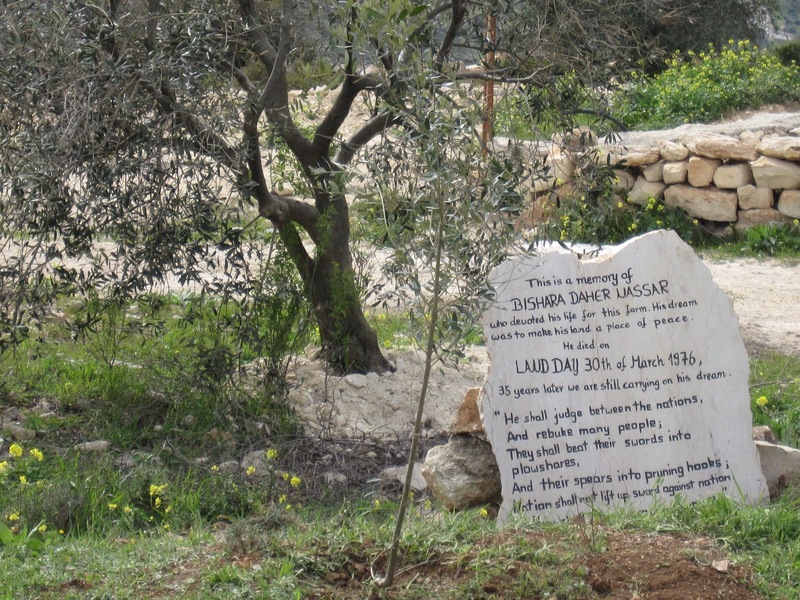 Meet Daher Nassar, a member of our Lutheran Congregation in Bethlehem. He's sitting by the entrance to his family farm on a hillside south of Bethlehem. 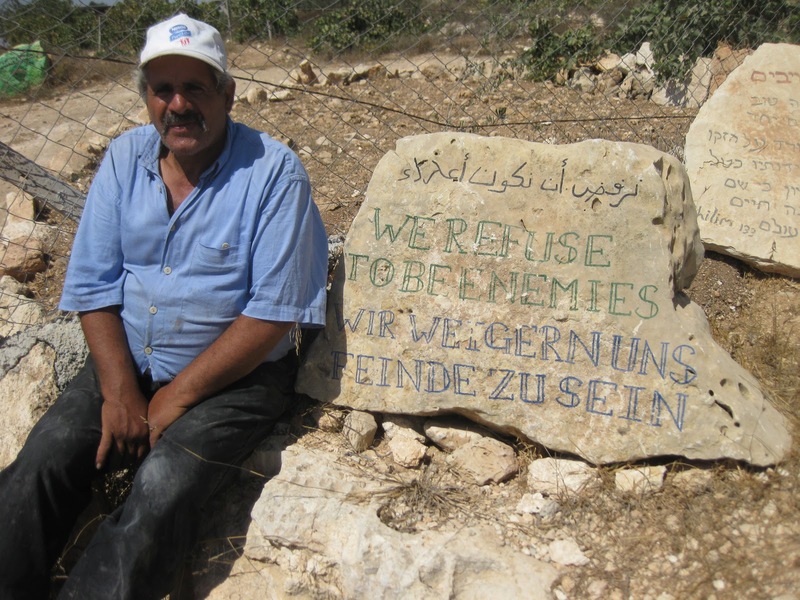 Next to him is the equivalent of a welcome mat inscribed in stone in Arabic, English, and German: "We refuse to be enemies!" From appearances, you probably are saying to yourself, "He doesn't look like an enemy to me." or "Whose enemy?" The problem is that his family owns a coveted piece of real estate. As long as he claims ownership, he is viewed as enemy by those who would like to move in and take control. Before going into the details about Daher's situation here at the end of 2012, we'd like to recall a similar episode nearly three millennia ago. 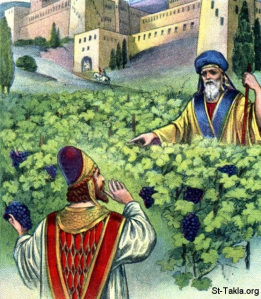 Back then, the Daher of the story was named Naboth and he owned a nice little vineyard next to the palace of King Ahab of Samaria. Read 1 Kings 21 for details. King Ahab began by coveting the land of his neighbor, and then did everything under his power--and we mean everything--to take control of land that was not his. But Naboth had other ideas. He was thinking about his kids and grandkids. The land was entrusted to him for future generations, and he refused the offer of the King, who assumed that all the land was ultimately his by divine right. Naboth was a loyal, law-abiding citizen, but the king turned him into an enemy, because he wouldn't give up his deed to the land. It's amazing what greed will do to a person. 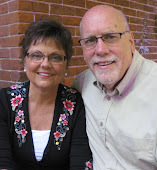 Ahab and Jezebel brought phony charges against their enemy Naboth, had him killed, and took possession of the land. The media sold it, and the public bought it. Naboth surely must have been a really bad guy, an enemy. At this point in the story, there was one man who did not buy it, Elijah the prophet. This man of God confronted Ahab in the vineyard, reminded him of the basic principles of biblical law, and turned advocate on behalf of Naboth's kids and grandkids, the legitimate heirs to the land. "Is that you, my enemy?" Ahab challenged Elijah. What's the world coming to when people are labeled as enemies who defend their own legal rights to land? What's the world coming to when those who stand up for the Naboths of this world, like Elijah, and who defend the rights of the oppressed, when they are labeled enemies? Back to the present day and today's Naboth-- our friend Daher. On a September visit to the farm, his hospitality showered us with delicious grapes straight off the vine. Daher's vineyard, however, although located in the West Bank, is surrounded by growing and expanding Israeli settlements. See the arrow on the map below. 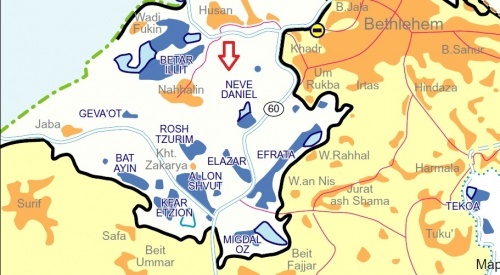 The four closest settlements were first established in 1982, 1983, 1975, and 1987, part of the strategy by Israel to take permanent control of the West Bank by creating facts on the ground. Already today theses four settlements number 50,000 residents and are expanding rapidly--just one tenth the population of all West Bank settlements. While the settlements were expanding and taking over other Palestinian properties, the Israeli government in the 1980s was making regular flights over the Nassar farm, photographing and recording patterns of crop production for the day when they could take over this property-- this info was revealed Daher and family decades later in court. Settlements are illegal under international law because they are built on land confiscated by an occupying power. They are immoral because their political purpose is to build roadblocks to peace. Every nation recognizes this illegal maneuver as land grabbing, except the State of Israel, yet it has gone unchecked for nearly four decades and now half a million settlers live on Palestinian property in the West Bank, armed with their own militias, and protected by the Israeli army. 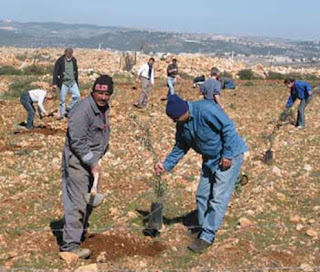 Anyone, whether the owner, Israeli human rights groups, the church, or other nations, who question or challenge such confiscation of land, is labeled an enemy like Elijah in the story of Naboth's vineyard. Only, Daher and family refuse to play that game. "You may label us enemies. You may treat us as enemies. But we refuse to be enemies." 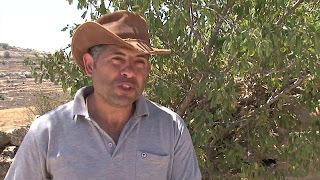 The settlers have often come by force, with weapons in hand to intimidate, to destroy property, to uproot trees, to block their access road, and to sabotage farm equipment, as on this 1999 day when younger brother Tony and niece were working on the farm. (photo right) Yet the family refuses to recipocate in kind. "Enemies? Not going to be one." The Nassars have pledged that they will only and always respond to violence with non-violence, but they will do everything in their power to hold onto the land entrusted to them. Daoud, another brother in the family, tells the story of one occasion when armed settlers came demanding to inspect the land. "No weapons allowed," he told them. They snubbed their noses and insisted on entering. So he made another request, "We Palestinians have a custom that whenever we have guests, we drink tea together, and then we do our business. First, you must accept my gift of tea." The settlers finally agreed to tea, and started to enter the gate, when Daoud reminded them, "No weapons." So they ended up leaving their weapons outside with two from their group, and joined Daoud for tea. After fidgeting while sitting there drinking tea, the settlers stood up, glanced around, and then left. 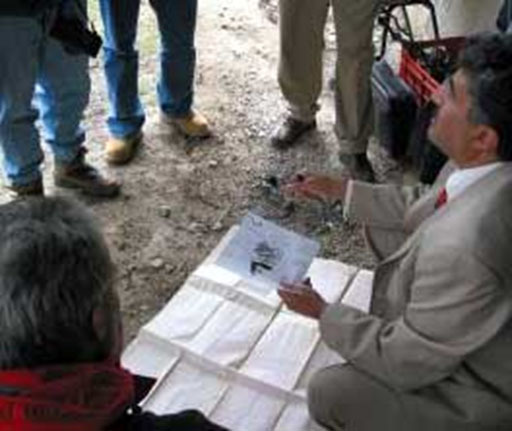 On another occasion when settlers confronted the Nassars, the family lawyer happened to be present on the land, and pulled out official documentation to demonstrate to the settlers once and for all the family's legitimate ownership. 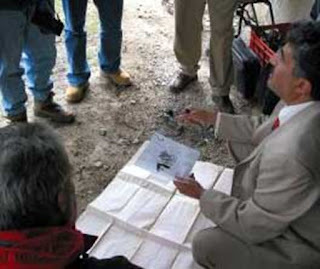 One of the settlers countered with his argument, "We have letters from God." One of the reasons that the settler movement has succeeded in obtaining more and more land for expansion is because many of the Nassar's neighbors could not defend their right to ownership with "acceptable documentation." Much Palestinian land came into families' hands during times when one's word was more important than a piece of paper and when the testimony of one's neighbors carried weight in court. So more and more land is confiscated and turned into State Land, which is then sold to settlers, who are in turn subsideized by the government. The Nassar farm has become problematical for the settlers because it is fully registered and documented. The grandfather of Daher, Tony, and Daoud, also named Daher Nasser, purchased these 100 acres on the picturesque hilltop in 1915, and it was fully registered with the British Mandate in 1924. 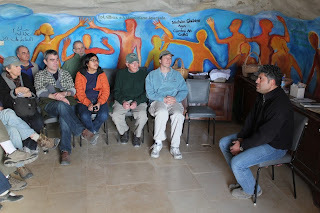 The family is reminded of this heritage everyday from these paintings on a central pillar in one of the farm's caves, now carefully carved out as a central meeting area. Here the elder Daher, on the left, is depicted with his two sons. Bishara, the current Nassars' father is pictured in the center along with his bachelor brother on the right. The Palestinian custom is that names skip a generation among the oldest. 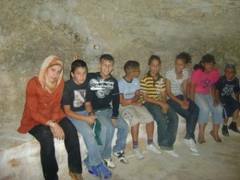 So Daher the elder had a son Bishara whose oldest son is the current Daher (of the blue shirt in photo at top) whose son Bishara is now a student in a Masters program in Peace Studies at Eastern Mennonite University in the USA, and this Bishara will pass on the name Daher to his eldest son. Heritage is important in this culture, and the most honorable family duty is to pass on the land to the younger generations. 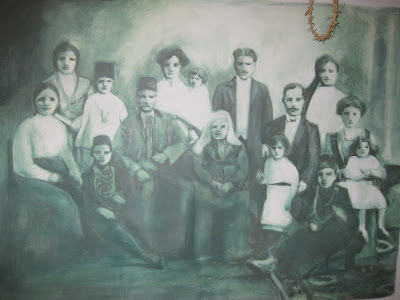 Here is another mural of the family to remind them of that heritage. When they purchased the land in 1915, the uncle of Daher and his brothers was only twenty years old, and volunteered to live on the land and farm full-time. He carved out an already existing cave to serve as his bachelor pad where he lived the bachelor life until he died at the age of 93. Bishara Nassar, however, settled in the town of Bethlehem where served as an evangelist, sharing his faith throughout the community. He married, and had a family of nine children. The youngest of the children, Tony, (here in photo with wife Nisreen and one of their four children), is Vice-Principal of our Dar al-Kalima Lutheran School, and instructor in religion. Tony was just four years old when his father Bishara died unexpectedly. Last March, we joined the family on Land Day, as they planted an olive tree to com- memor- ate the 36th anniversary of Bishara's death in 1976. Bishara left behind his widow and children who grew to raise their own families dedicated to their community and to the church. 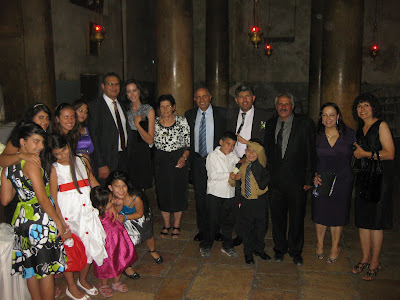 In the photo below Bishara's widow poses with four sons, a daughter, and grandchildren at a recent wedding at the Church of the Nativity. We value two full decades of friendship with this amazing family who remain a model of Christian faith and life in Bethlehem. All those years, family members would head out to the farm, often spending their nights there, assisting with the tasks of planting, watering, weeding, and harvesting. Under occupation, these chores became more difficult, since Israel limited access to water from the acquifer underneath their own land. In 1988, when their bachelor uncle died, they began to lag further and further behind with the farm work. 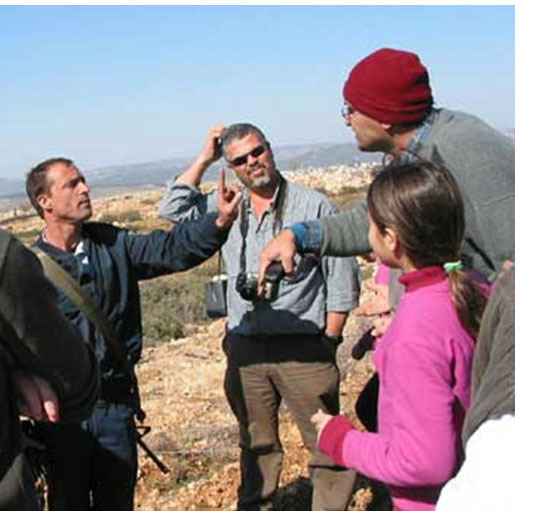 Three years later in 1991, they learned that the Israeli military government had issued confiscation orders for three quarters of the farm according to Israeli absentee land policies. It was only by a fortunate encounter with a resident from the nearby Muslim village of Nahilin that they learned about the confiscation order, which had been delivered mistakenly to the village. 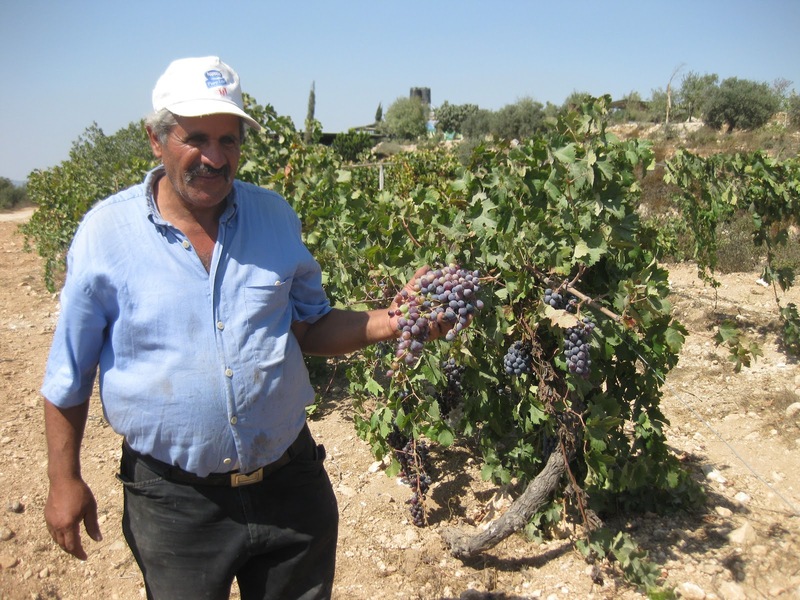 Pastor Mitri Raheb, who would include a chapter about "Daher's Vineyard" in his book I am a Palestinian Christian, invited us to accompany him for our first visit to the farm in May 1992. This would lead to numerous work days for us over the next decade clearing rocks from the fields, planting trees, vines, and annual vegetables, and hauling water to the the fields. Mitri began to mobilize an international network of support, and explore ways to assist in the defense of the land. One of my former students, took off a year from University of Iowa Law School, to help the family gather legal evidence and obtain legal defense. The long story of the family's experience with Israeli courts is explained on their family website, www.tentofnations.org This included payouts of several hundred thousand dollars in legal expenses to obtain documentation from Ottoman records. They would receive periodic announcements about scheduled days in court. Yet they would show up again and again only to learn of postponements. Finally when their day in court turned to reality, the govenment's evidence was declared insufficient. Yet that has not brought an end to the quest to take away this family farm. In the past year, they have received demolition notices for buildings on the farm, which, if they are carried out, will make it more difficult to continue the family presence on the land, and impede their efforts to farm the land. By prolonging the ordeal for two full decades, the strategy of the settler movement, and the pro-settler government, seems to be aimed at wearing the family down and piling up additional costs for defense. Yet the family remains steadfast in holding on to the land. The Nassars recognize that they cannot do this alone. Visiting church groups often spend an afternoon, or even a whole day, helping with farm work. Young adults from Europe or the States off sign up to volunteer on the farm for three months to a year. 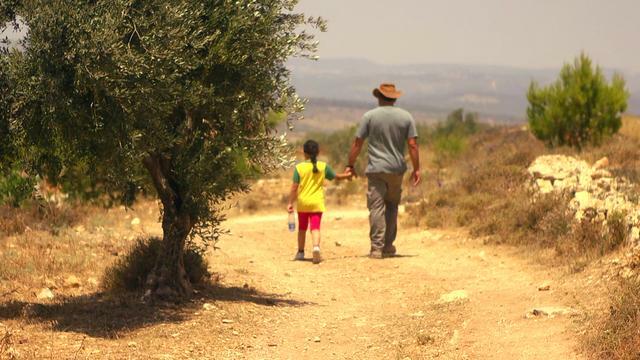 The family runs summer camps for Palestinian children from Bethlehem and neighboring villages. 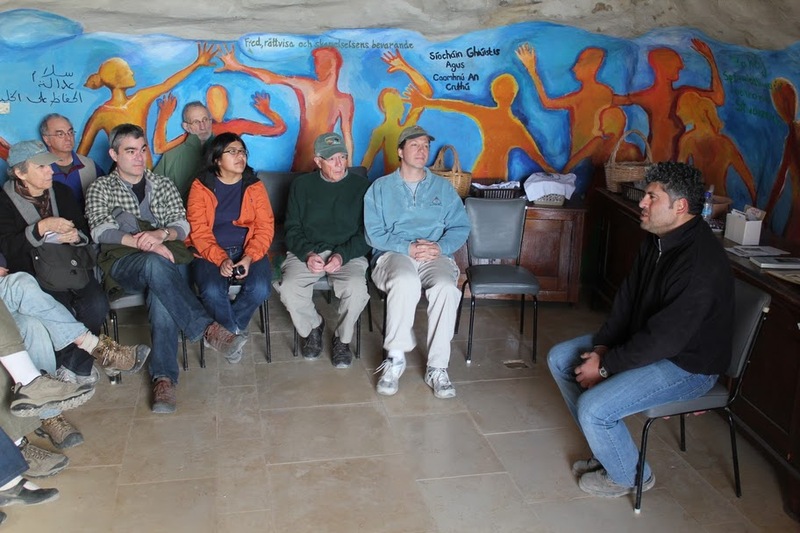 Daoud meets with visitng groups in one of the cave rooms, sharing with them the family's vision for the land and their future. And what is that vision? 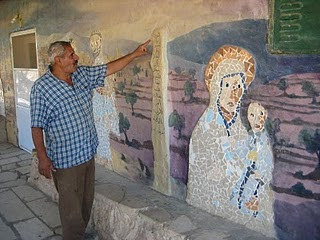 Daher answers by pointing to a mural on the wall quoting Psalm 133. Psalm 133: "How good and pleasant it is when kindred dwell together in unity."